Austrian Airlines is the flag-carrier airline of Austria and a subsidiary of the Lufthansa group. Its headquarters are located at Vienna International Airport and it operates services to over 130 destinations worldwide. Austrian Airlines is a member of the Star Alliance. 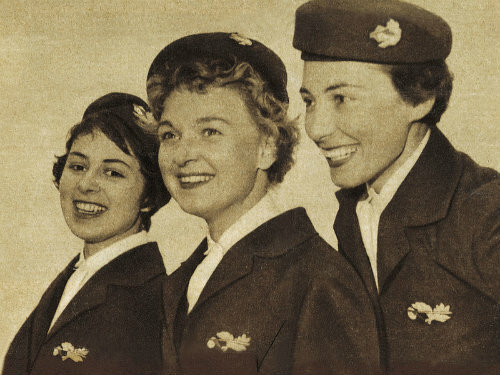 Austrian Airlines’ first flight took place in 1953 with a service from Vienna to Budapest, some of the destinations on their first schedules included Munich, Budapest, Nuremberg, Graz, Klagenfurt and St Wolfgang. Like many of the smaller European airlines, they were affected by the political events of the Second World War. After the annexation of Austria by Germany in March 1938 the airline came under the control of Lufthansa and in June 1939, the company was deleted from the commercial register. This meant that at the end of the war when Austria was separated from Germany again, they were left without a national airline. Austrian Airlines was eventually able to be re-formed in 1957, making its maiden journey from Vienna to London via Zurich. Trans-Atlantic routes began in 1969 with a Vienna to New York via Brussels service. Austrian Airlines flies to five domestic and more than 120 international destinations in fifty countries across the Middle East, Europe, Asia and North America. As well as its Star Alliance partners, Austrian has agreements with several other airlines including airBaltic, Air Malta, Belavia, Iran Air, Montenegro Airlines and Transaero Airlines. Austrian’s aircraft are an average age of fifteen years old. It is currently made up of a mixture of Airbus, Boeing and Fokker planes, most of those being A320’s. 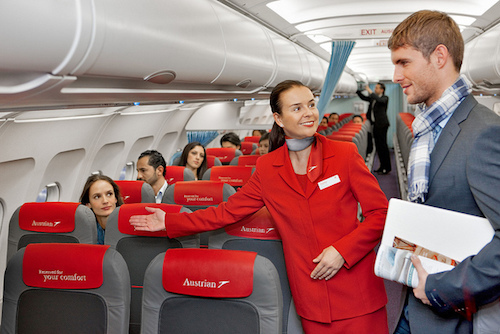 Austrian operate both Business and Economy Class on their aircraft. 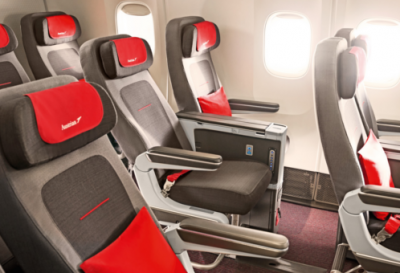 Since 2011 all Austrian planes of the Airbus A320 family have been equipped with new seats and new cabin designs. 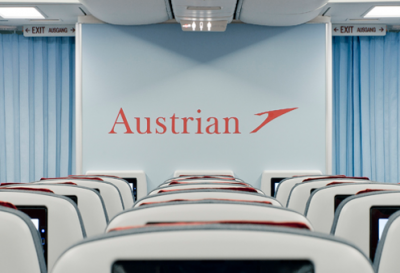 By September 2013 Austrian’s entire long-haul-fleet (Boeing 767 and Boeing 777) also got new seats and a new cabin design. Business Class contains fully-flat-beds almost 2m in length with an integrated massage function and aisle access from nearly every seat. Some of the Boeing 777’s have a 2-2-2 configuration, but other B777’s and all B767’s are configured as 1-2-1. In-flight entertainment is provided on a 15-inch screen wide a wide choice of TV and movies, including options for children. Austrian claims to have secured some of the world’s best catering with Do & Co developing multi-course menus. The order of your menu contains soup and appetisers from the trolley, a choice of three main courses plated and served individually, a large variety of drinks including alcohol, and a selection of desserts and cheese from the trolley. The Austrian Amenity Kit is designed with traditional Austrian motifs which has made it a bit of a favourite with collectors. It contains toothbrush and paste, sugar free mints, sleeping mask, earplugs, socks, shoehorn, and moisturiser. 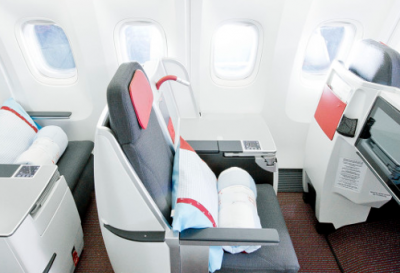 Read our review of flying business class with Austrian Airlines. Business Class on board Austrian Airlines. The latest developments in Austrian’s Economy Class have involved new ergonomically-designed seats with a unique relax position, and video-on-demand for every passenger. Seat configuration on long-haul flights is 3-4-3 on the Boeing 777’s and 2-3-2 on the Boeing 767’s. 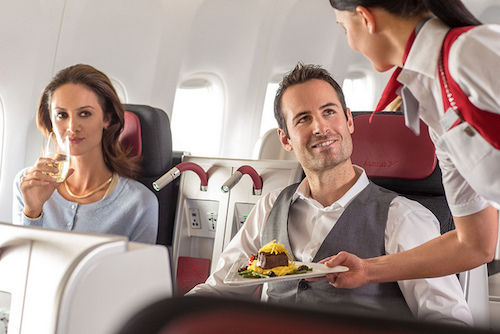 Your meal service in Economy will include two choices from the main menu, and depending on the time of day, you will receive either breakfast or a snack shortly before landing. A wide selection of hot and cold drinks are available throughout the flight.